April 3 1968. Room 306, the Lorraine Motel, Memphis. The smell of cigarettes and coffee hangs thick in the air as Dr Martin Luther King Jr winds down from a day of preaching and marching. 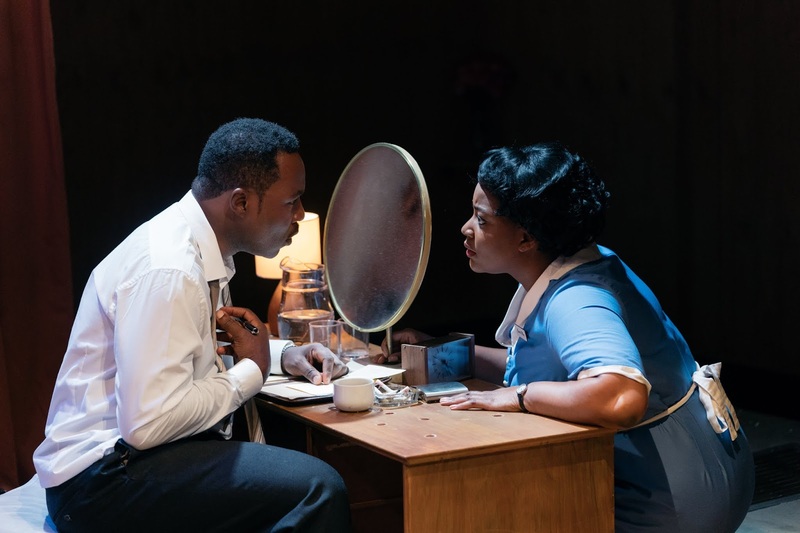 In the 50th anniversary year of the assassination of Martin Luther King Jnr, the Olivier Award winning play about the hours before his death embarks on its first UK tour following a sold out run at the Young Vic theatre in October 2016. 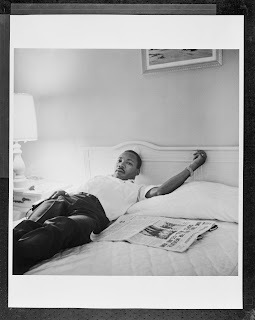 Martin Luther King Jnr (Gbolahan Obisesan) enters his motel room. It is sparsely furnished: 2 double beds, a couple of tables and chairs. Previously used mugs of coffee are on the bedside cabinet but he needs a fresh brew so he calls down for room service. Whilst the motel doesn’t offer such a service anymore, the news of King’s rousing speech earlier in the evening ensures that they make an exception and they send a maid up with his caffeine filled drink. When Camae (Rochelle Rose) appears, she not only has a drink – she also has his preferred brand of cigarettes and something stronger to help with his voice. King suggests that she takes a break and this gives them an opportunity to smoke and discuss the campaign. As the storm brews outside, the pair chew events over, pausing only for the occasional roar of thunder. The preacher is clearly paranoid about outsiders, checking the phone and furniture for listening devices. He has a lot yet to accomplish but he is acutely aware of those who want to stop him. Director Roy Alexander Weise was the 19th annual winner of the James Menzies-Kitchin Award and he directed the original production at the Young Vic. The action is evenly handled but, significantly, a decision has been made to run for 1 hour 45 minutes without an interval. This helps maintain both the tension and the atmosphere. The lighting design too, initially, helps with the atmosphere of the 19060’s motel room. Later on the sound and lighting takes on a different dimension…but no spoilers here! Whilst the website states a recommendation of 16+, we would suggest that this is perfect viewing for students of GCSE history or drama. Yes there are the occasional curse word but it fits in with both the historic context and the dramatic setting. 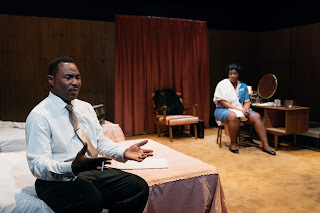 Gbolahan Obisesan and Rochelle Rose are both highly engaging in this two-handed production. They draw you in to the world of the preacher who spends a lot of his time on the road making controversial speeches. Gbolahan succeeds in presenting the private side of a man who literally gave his life in order to stand up for his values. Rochelle’s maid is no push over either. The Mountaintop delivered a powerful, thoughtful and measured production. Good acting and a strong narrative provide a timely reminder of the struggles still faced by many in society.